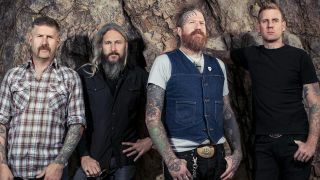 Mastodon guitarist Bill Kelliher says that unless action is taken to give bands a fairer cut from their music being streamed online, many will go to the wall. In 2016, figures claimed that a songwriter would need 288 million streams of their work to earn the average salary of a Spotify employee, with Van Halen manager Irving Azoff and Metallica manager Peter Mensch having spoken out against YouTube in the past. And while Kelliher says that he thinks Spotify, Apple and Pandora are “amazing” he fears for the future of music. He tells Let There Be Talk (via Ultimate Guitar): “I use Spotify all the time. It's so simple, it's so easy, it's a no-brainer, you can download as much music as you want on your phone and listen to it anywhere. The act, which paves the way for improved digital royalty payments to songwriters and artists, was just last week approved by the Senate Judiciary Committee. It will now go before the full Senate who will consider the issue. Kelliher cautions: “In my opinion, if this continues, the artist is going to disappear because we cannot afford to go out here. There's so many people behind those songs you hear on the radio. I can only speak for my genre and the people who know how we do it. “When it comes to us doing a record, sometimes that means paying a producer over $500,000. That comes out of your pocket. The record company fronts you that money. “This is how it works – they give you the money up front, they say, ‘Here's $600,000, you're going to make a record that’ll cost $575,000.' So there's that money. You owe that money back to the record company and they own your music. Why, I don't know. “I guess they're lending you the money to make a record, but once it hits the internet and it goes out there for free and people just download it, where’s the money to be generated to make that money back? There is no way to make that money back. Kelliher adds: “I could live a thousand years and if Spotify played all day long, I’d maybe make a couple of thousand dollars. It's miniscule. The only way to make any money is to get out here on the road and tour constantly." He goes on: “Record companies are desperate. They have no idea what to do because they've completely given up the keys to the kingdom, to Apple and Spotify and Pandora. "So now they're trying to talk bands into giving them part of their merch. A lot of people say, 'Why are your t-shirts $50?’ Well, the venues take up to 30% of that right off the top. "So our $50 t-shirt, we're only getting $30. But that $30 has to be split up between management, lawyers, taxes, everything. Tour buses, just to rent for a month, are $60,000. It's ridiculous. Back in April, Mastodon released an animated video for their Emperor Of Sand track Clandestiny and they’re now on the road across the US with Primus and All Them Witches.